Ethan Beute and Stephen Pacinelli are marketing executives for BombBomb, a software company dedicated to helping businesses rehumanize their professional communication. Through the use of personal video, people in every kind of work are communicating more clearly, connecting more deeply, and converting at a higher rate—all while building relationships that bring professional success and personal satisfaction. Ethan has a background in and passion for brand, strategy, and content. To help people communicate more effectively with simple videos, he produces blog posts, videos, newsletters, webinars, social posts, stage presentations, and more. 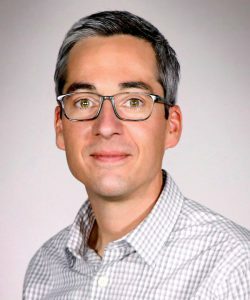 Prior to joining BombBomb as Vice President of Marketing, Ethan directed the marketing efforts for local broadcast television stations and websites in several states. For the past fifteen years, Steve has delivered more than 1,000 presentations on the benefits of sales automation and online marketing. He cofounded Tech Savvy Agent and is now Chief Marketing Officer for BombBomb. Steve has built businesses around several of his successful websites and blogs utilizing the power of video. We speak to Ethan about working with Steve, BombBomb, and their book. BombBomb is about building relationships. Describe the evolution of your professional relationship. EB: Steve was an early customer and friend of the company. A sales team leader for Realtor.com, he helped introduce us to the real estate industry, and our team sent him out at trade shows, conferences, and events throughout the year. After years of getting to know him, we worked to see if we could bring him into the company; fortunately, he liked the idea. 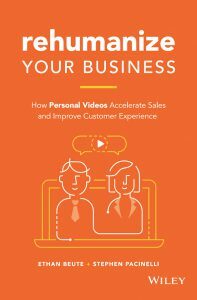 What was the impetus for your book, Rehumanize Your Business: How Personal Videos Accelerate Sales and Improve Customer Experience (Wiley, April 2019), and how did you approach the coauthor relationship? EB: We’d basically written the book on this simple, personal style of video with, for, and through our customers over years of teaching, learning, and practicing it—and through webinars, stage presentations, blog posts, etc. It was time to literally write the book, and our publisher, Wiley, agreed that the market was ready. We worked together to build out the table of contents, then I took the lead on writing. Steve brought a deeper and stronger sales sensibility to it and worked as the reader advocate in changes, edits, adds, and recommendations. We went back and forth combing it out, then buttoning it up. How did your experience as colleagues in a company that prioritizes communication assist in the writing process? Any unforeseen drawbacks? EB: We experienced no drawbacks. We’ve shared a vision for years, and the book just captured the best of it in one piece of writing. We worked face to face through Zoom and asynchronously through Google Docs. Constant communication through a variety of channels and media helped us achieve our goal ahead of schedule. Is the use of personal video in text communication more geared toward a particular type of worker such as remote over in person, independent contributor over manager, or sales function over operations? EB: In the book, you’ll read about personal video adding value to the sender and the recipient in all kinds of industries, departments, teams, and roles. Because trust and clarity are so important in every human relationship, that face-to-face element serves everyone well. Leader to team member. Salesperson to prospect. Success, support, or service person to customer. Professor to student. Peer to peer. It’s all human to human. And we communicate, connect, and convert most effectively in person. Video allows you to do it at scale—in a way that overcomes both time and distance. When we’re already sharing so much of ourselves on social media, how is video uniquely suited to a more interactive exchange? EB: We don’t focus on becoming a paid “YouTuber” or an Instagram “influencer.” These are one-too-many and often anonymous relationships between sender and recipient. We’re focused on recorded video communication between specific people: one customer; five people involved in a project; twenty-eight team members, etc. Many of the skills you’ll learn and develop through the book and in practice will be transferrable to other video styles and communication channels, but we’re very focused on direct communication through video in place of some of your plain, typed-out text. How can personal video, used professionally, make us better communicators in our personal lives? EB: The principles of including in your messages empathy, value, and clear calls to action play well anywhere. Meet people where they are, deliver or promise value (like an answer to a question), then make clear the next step or two. This works on stage, on a webinar, in a blog post, in a typed-out email, in a voicemail, and even in a conversation. Ultimately, we’re about restoring our most effective and satisfying way to communicate — eye to eye and face to face — with all the rich nonverbal communication missing from so much of our digital communication. Our philosophy is about human connection above all.